In our new world nearly everything is “thinking”, or at least digitally communicating – from a simple toaster to connected cars, smart factories & robotics. This Digital Transformation across global industries is driving us all to evolve and revolutionize our existing offering towards intelligent automation in a fully connected world. In our fast-paced world, for all, even hardware manufacturing companies, software innovation has become a critical source of competitive advantage, the development of custom applications that help them engage with customers, suppliers and employees. 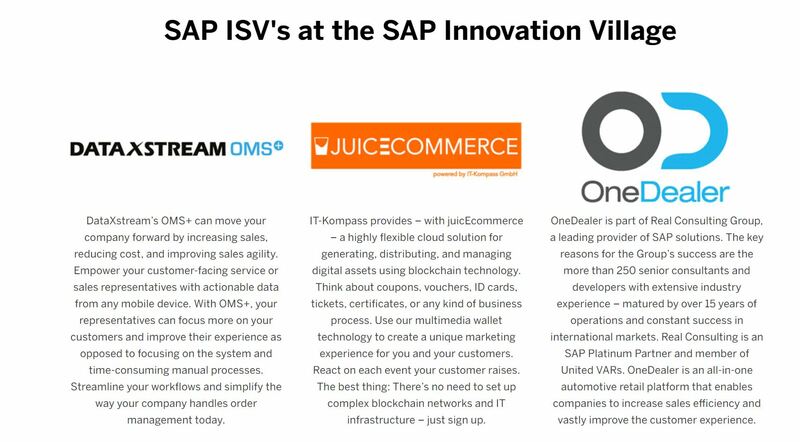 Visit the Innovation Village at the SAP stand in Hall 3N 31 and meet the ISV team and some of our partners like Real Consulting, IT-Kompass and DataXStream and their innovative, game-changing solutions based on SAP technology. Abstract: Join us for this interactive panel discussion with SAP ISV partners to learn how modern technology platforms built from the ground up can help customers successfully navigate their digital transformation journeys and deliver the operating efficiencies they seek to win in a competitive market. Abstract: In a globalized world where competition can come from anywhere, no company or industry is immune to change and/or wholesale disruption. However, with the right innovation platform, established players too can become the digital disrupters of tomorrow. Learn how SAP can help you maintain your competitive edge in this age of data where the proliferation of data leads to new business opportunities unimagined before. Wishing all of you a great Mobile World Congress 2019!